In addition to joining forces to raise awareness of the impact of ACEs, Senators Heitkamp and Durbin are drafting legislation based on a framework they have shared widely with stakeholders, other members of Congress, and federal agency officials. A first draft of the legislation may be ready to share as early as this week. The purpose of the briefing was to provide an overview of public policy initiatives to build capacity to prevent ACEs, build resilience, and implement trauma-informed approaches for children, families, and communities. Sen. Durbin’s interest in ACEs originated in the gun violence in several cities around the country, most notably in Chicago. In 2016, Chicago has seen more than 700 murders (including the grandson of Congressman Danny Davis from Illinois). Durbin explained that he first came to the issue of ACEs by examining the role of guns in community violence, but has since broadened his perspective to include the root causes of violence. He recalled an answer a counselor from the Cook County Juvenile Justice Center gave him when asked about what kind of ACEs they found among kids receiving services at the center and the response is “everything”. Children are receiving diagnoses of depression, bi-polar disorder, and schizophrenia. Perhaps more sobering, analysis demonstrates that 92 percent of Chicago children have been victims of or witness to violence. Cicchetti emphasized the importance of taking a public health approach to mental health and wellness adding, “We can’t mental-health our way out of this problem.” She cited an enormous unmet need for mental health services for children in Chicago that is the result of a shortage of mental health providers and the fact that even when services are provided, they are not well coordinated. While the majority of services are provided to children in schools, according to Cicchetti, its leaders resist adding additional trauma-informed services unless they are convinced that they will help them achieve their core functions to improve grades, behavior and attendance. Panelists agreed that there is a public health emergency—the crisis being exemplified by an increase in suicides in wealthier communities such as Palo Alto, CA, and opioid overdoses across all income levels. They expressed conviction that there is potential for real systems change through neuroscience-informed policy and practice. Dr. Christina Bethell, director of the Child and Adolescent Health Measurement Initiative, Johns Hopkins Bloomberg School of Public Health, was introduced by Ellis as “much more than data nerd”. Bethell provided a healthy dose of data coupled with a strong emphasis on the potential for healing through individual empowerment for parents, children, teachers, and providers. The key to healing as described by several panelists is “safe, stable, and nurturing relationships” that can buffer adversity. She believes that there is a huge cultural change underway driven by ACEs science and the recognition that preventing and intervening in ACEs is key to addressing unsustainable increases in healthcare costs. To accelerate the collection of data and spread best practices, Bethell recommended the use of open source technology and citizen science (e.g., using social media to collect data). The specific challenges of addressing trauma in rural areas were described by Joe Barnhart, an attorney from Crawford County (PA) Human Services and leader in Peace4Crawford, a trauma-informed community initiative modeled after Peace4Tarpon. Crawford County, a 1,000 square-mile community north of Pittsburgh, has a population of about 81,000. He said while the number of heroin and opioid overdoses are not huge, they are growing substantially and county resources to handle the increase are limited. Efforts are underway in Crawford County—some supported by the federal government—to encourage collaboration among agencies serving children and their families (e.g. schools, child welfare, drug and alcohol programs). According to Barnhart, collaboration is needed to reduce complicated and fragmented systems that re-traumatize children and families. Barnhart described several challenges to making real change in the county: removing obstacles to collaboration such as privacy regulations that hamper information sharing, implementing inter-generational approaches, and addressing root causes rather than treating symptoms. Several speakers described promising approaches such as peer-to-peer and family-to-family services, involving faith-based organizations, and building system capacity, including transportation—an especially challenging problem in rural areas, and credentialing of a trauma-informed workforce that enhances primary care services. Increase system capacity. Whether you are in America’s largest cities or in a rural community, it is evident that the need for trauma-informed care and prevention and treatment of ACEs far outstrips the ability of cross-sector systems to respond. In Chicago, a city with vast health care resources and community supports (compared to Crawford County, PA), there is a waiting list of 800 children for access to a psychologist. In Crawford County, there has been a 186% increase in demand for heroin screening and substance abuse treatment. Create policies to foster cross-sector care coordination. The treatment and prevention of ACEs cuts across multiple social service, health, education and public systems. Barnhart illustrated this point with free-form drawings of “Billy the Systems Kid”. This case study depicted a child in multiple systems that are part of Billy’s system of care. Yet these systems neither operated in a coordinated fashion nor shared data in a way that makes treatment more accessible and efficient for families. Oftentimes, disconnected systems create more burdens, if not more trauma, for children and families who are forced to tell their story ‘over and over’ again. Foster collaboration & alignment across sectors and systems. There is need for enabling policies that foster and incentivize collaboration and coordination of care in a trauma-informed manner. While we have evidence of what works and promising practices, the landscape is populated with isolated “laboratories of design”—communities crafting solutions to address trauma, sometimes building the bike as they ride it. There is a need for a roadmap that helps communities create alignment across sectors and systems to address the needs of vulnerable communities. Increase data sharing to foster understanding ACEs as a public health crisis: As data presented in the briefing illustrate, ACEs cut across race and economic lines with equal probability of experiencing them regardless of your zip code or ethnicity. As was illustrated in the briefing, ACEs are symptoms of a community planted in poor soil (adverse environments). 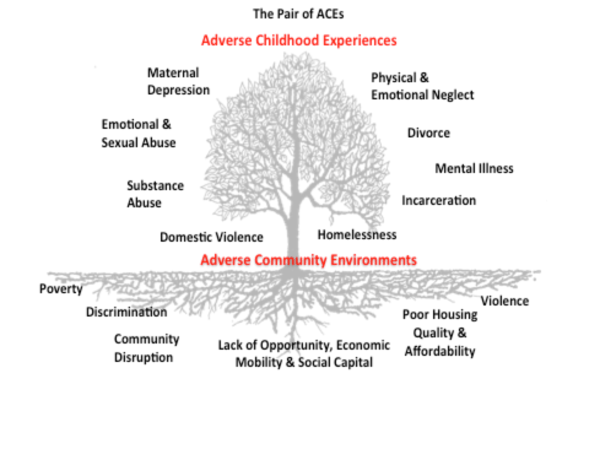 ACEs outcomes such as substance abuse, domestic violence, and child neglect are produced in soil steeped in violence, lack of economic mobility, poor schools and low housing quality. This speaks to the pervasiveness of trauma but also a need to understand the buffering effects of education, social supports and trauma-informed practices to help individuals not only bounce back but ‘bounce forward’. Whether you live in a Chicago neighborhood besieged by gun violence or in a rural Pennsylvania county in the grips of a heroin epidemic, the impact of ACEs are the same. Communities across our country must be equally trained and resourced to respond and build resilience. Build support for addressing ACEs through healthcare: As was discussed at the briefing, there is a critical need to educate physicians and the health workforce about the impact of social determinants and ACEs on health. Efforts to require social determinants of health and ACEs training as part of Graduate Medical Education (GME) and Continuing Medical Education (CME) are potential policy levers recommended at the briefing. In addition to GME and CME reform, there is a critical need to examine roles within the lay health community and para-professionals who can deliver trauma-informed support, recognizing physicians are limited in 15-minute visits. The December 1st briefing was the last in a series sponsored by the Campaign for Trauma-Informed Policy and Practice (CTIPP), a new organization created to promote policies and programs that are informed by the science of ACEs and trauma. The first briefing focused on the science of trauma and the second highlighted trauma-informed programs and practices. To view the entire briefing, see the video section of ACEsConnection.com. Boy, I sure hope this helps but seems the Republicans are strongly anti-science, anti-child/women/minorities and anti-social services. My guess is to forget government support under this federal and state administrations and seek out private charities.